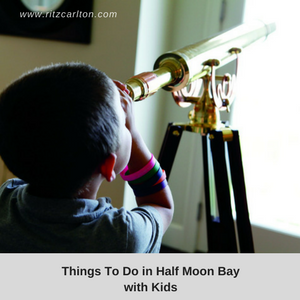 There are a lot of reasons to bring your family and kids to Half Moon Bay. Referred to as the World Pumpkin Capital, Half Moon Bay is the main coastal town between San Francisco and Santa Cruz, where you can find so much more than pumpkins. Plan the best spring getaway and explore plenty of adventures with your kids at this beautiful coastal city. A 30-minute drive from Half Moon Bay, Pescadero has three must-dos with kids: Harley Goat Farms for goat cheese sampling and a tour if you time it right, a stop at Arcangeli Grocery Co. for a loaf of artichoke bread, and lunch or dinner at Duarte’s Tavern where cream of artichoke and cream of chili soup is a highlight. Tip: There are picnic tables near the grocery and goat cheese pairs very well with artichoke bread. If your kids can’t leave their pets at home, dogs are welcome on the patio at Half Moon Bay Brewing Co. where spent grain leftover from the brewing process is made into “Mavericks Bones” dog biscuits. The pesto whole Dungeness crab and crab nachos are a must-try. If you miss the great pumpkin weigh-off in October, the 2014 winner weighed in at a whopping 2,058 pounds, you can buy your own take-home sized version at seasonal pumpkin patches. Also, during the rest of the year, local restaurants feature a variety of pumpkin dishes and desserts. The sound of bagpipes playing is the first clue that there’s something Scottish about The Ritz-Carlton, Half Moon Bay. One look at the seaside cliffs and guests are transported to the coast of Scotland though the sunset is pure California. The resort has enough on-site activities to keep the entire family busy though the view is so stunning it’s tempting to curl up in the adirondack chairs and never leave.